This page gives you a basic overview of our APIs. We are here to help - If you want to implement an application based on our API let us know and we will try to support you as good as possible. The purpose of our API is to allow 3rd party applications to use data stored in WorkTrail. The API provides easy access to all data - including tasks, projects and all work entries which were recorded by our users. But before any app can access this data it has to be authorised by a manager of the company. 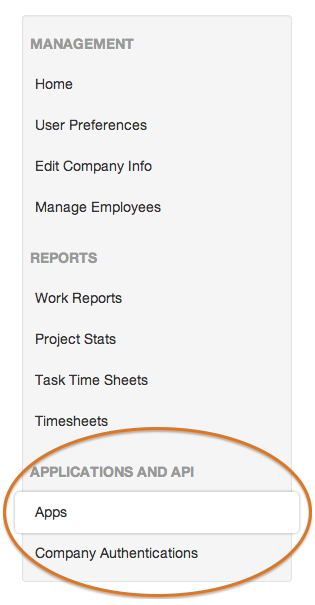 Once enabled you will have the new menu entries "Apps" and "Company Authentications" within your navigation. First of all you have to register your app to receive API Keys. Next you have to implement an Authorisation Flow to get access to data of a given company.